We will automatically give you FREE access to our new PREMIUM teaching system. You can choose the PREMIUM or Standard system. Click here to sign up for the PREMIUM SYSTEM NOW! Add each of your students. The Premium System will give them a Coin Quiz (Students earn avatar features with coins). The Standard System will give them a Quick Quiz (The Coin Quiz and Quick Quiz can be used interchangeably). Step 2 - Instructional Videos - Zippy stars in over 100 new animated videos (Memorize Videos, Understand Videos, Review Videos). Step 5 - Practice with Games - Students practice ONLY the facts they know and are working on during gameplay. 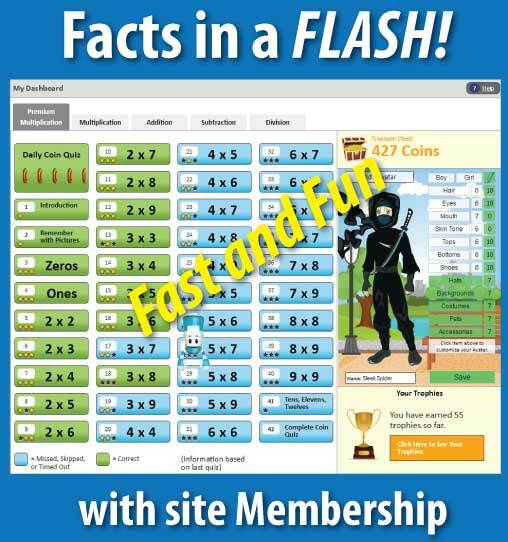 Fact Snapshot - Student accuracy on the Coin Quiz and Quick Quiz. Daily Time Usage Report - Color pie charts on a calendar showing time spent at different activities. Includes a digital download of the student e-book.